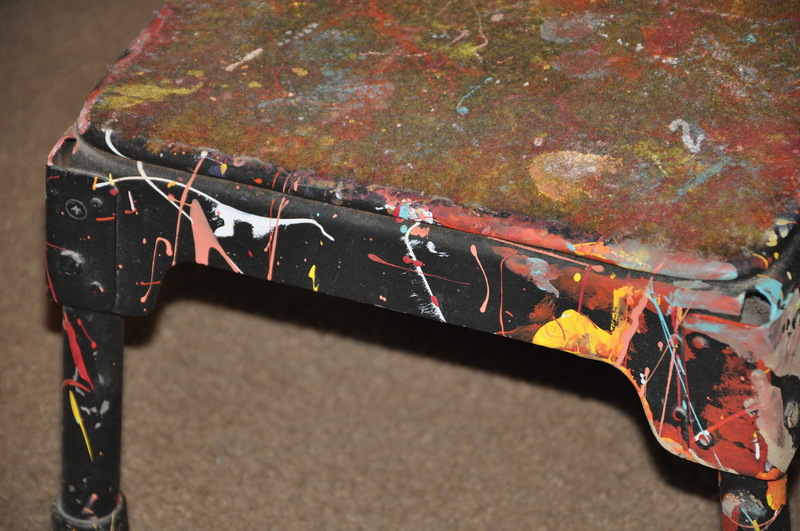 One might expect a brush with true celebrity to leave something a little more memorable than a paint spattered stool. This particular stool, however, has a story. Dennis E. “Denny” Dent (April 5, 1948 – March 29, 2004) was an American speed painter who was known for his wild performances as he painted large portraits of celebrities, frequently onstage to the accompaniment of music and in front of an audience. Dent ‘s resume is impressive. He performed at Woodstock ’94, and at President Clinton’s Second Inaugural Ball. He painted the portraits of legendary musicians like John Lennon, Elton John, Mick Jagger, Jim Morrison and Garth Brooks as well as other notables such as Albert Einstein and Martin Luther King. He visited Oklahoma in 1997 to paint with Ballet Oklahoma and again in 1999 to support United Way. A Denny Dent performance, which he referred to as a “Two-Fisted Art Attack,” was an astounding thing to see. He was a berserker, a whirling dervish, a tornado with multiple brushes in both hands. At times, he grabbed paint with his bare hands and flung it or fingerpainted it onto the huge canvas to musical accompaniment. From nothing, from a large blank canvas, almost like a photo coming to life in the developer solution, his image would appear. His “Art Attacks” rarely lasted over ten to fifteen minutes. With a final flourish, he signed his newly-created paintings with a paint-laden handprint. Dent performed at the 1997-98 Ballet Oklahoma season opener in October, 1997 and that is the beginning of the story of the paint-spattered stool. In the course of his “Two-Fisted Art Attacks” with the ballet corps, he used this stool onstage. 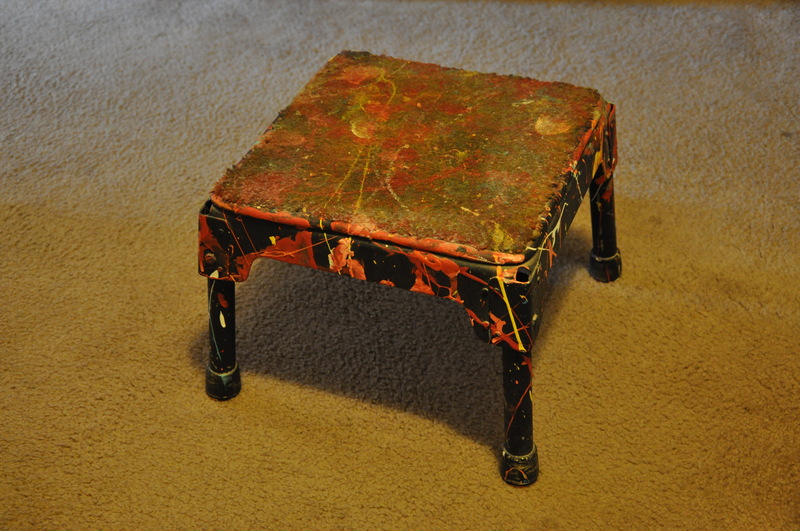 His three performances, painting a life-sized ballerina in twelve minutes while the dancers performed, inadvertently created another masterpiece—this paint-spattered stool. 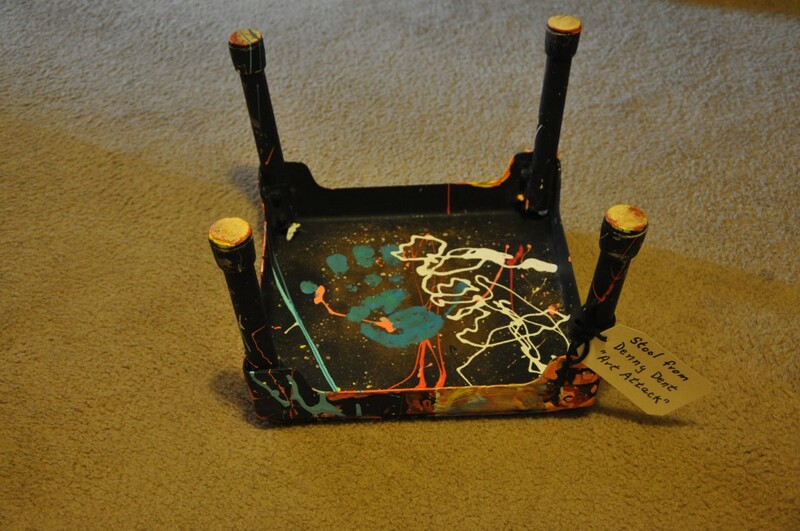 Note his signature handprint in paint on the bottom of the stool. Dent is gone now, ironically brought down by a “heart” attack in Denver, Colorado. The memory of him onstage, paint flying as the music pulsed, as the dancers flowed around him, as the image on the huge canvas transformed from a mess of paint spatters into the image of a ballerina is a memory I will treasure forever. Facts from Wikipedia, the free online encyclopedia and THE OKLAHOMAN archives.